The world will never be the same after the eruption of revelations from WikiLeaks—and there’s a lot more to come. A mountain of leaked emails, more than five million, remains to be explored. WhoWhatWhy’s Douglas Lucas—shown here in the video—is one of the few forensic journalists who’s been picking his way through these emails, all of which came from the private intelligence firm, Stratfor. Lucas’s painstaking research and incisive analyses have already produced several in-depth articles. One offers a surprising explanation for General David Petraeus’s downfall from the CIA. Another reveals Drug Enforcement Administration plans to kill “narcoterrorists” in Mexico. 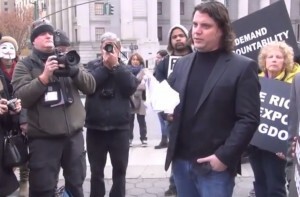 Lucas was interviewed by Jeff Durkin of We Are Change Connecticut outside the New York City courtroom where, on November 15, hacktivist Jeremy Hammond was sentenced to ten years in prison for, among other things, providing Stratfor emails to WikiLeaks. Thanks to Hammond, we have a better picture of what goes on behind the closed doors of the powerful. We now know, for example, that Stratfor had been spying on human rights activists at the request of corporations and the US government. And we now know about the Trapwire surveillance system that identifies and cross-references “suspicious behavior” from CCTV footage in cities nationwide. Internet-savvy activists apparently send the US government and spy contractors into panic, as shown by documents revealing a sealed indictment against WikiLeaks publisher Julian Assange, and by the fact that spy contractors were tasked with such dirty tricks as falsely connecting journalist Alexa O’Brien’s campaign finance reform group, US Day of Rage, to Islamic fundamentalism. Hammond’s grossly disproportionate sentence, another example of the US government’s crackdown on journalists and their globetrotting geek sources, may be a reflection of the surveillance state’s fear of what the activists are accomplishing.